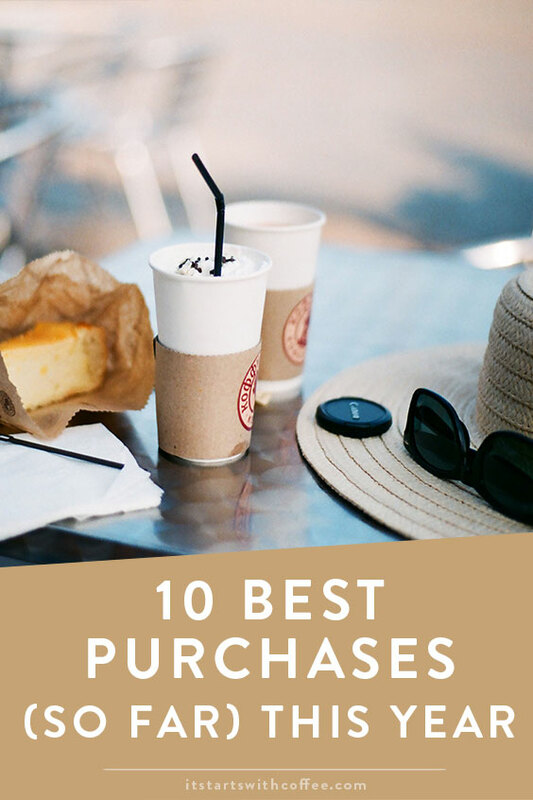 So I probably should have titled this 10 best things I’ve either been given, purchased, or was sent this year, but that would be insanely ridiculous for a blog title. So these aren’t all 10 best purchases but they are things I have acquired in one way or another this year so far! Yoga Mat: So I started doing yoga pretty regularly this year and figured I needed to invest in a better yoga mat. I asked on a local Facebook group and I got so many recommendations for a Jade yoga mat. It’s been great and I feel like it’s kept me encouraged to keep practicing. Ice Roller: I saw so many people talk about these and considering they were pretty budget friendly I had to give it a try. I use it almost every day and it is beyond refreshing and I notice a huge difference in my skin. Origins Smoothing Souffle: I was sent this from Origins and I have since repurchased it several times. It is my go to body lotion and is insanely hydrating. It got me through the winter months. Tata Harper Face Wash/Lip Balm: The team from Tata Harper sent me an amazing package and these were two of the items in it. The refreshing face wash and the lip balm are wonderful and they are CLEAN of any crazy ingredients. AirPods: These were a birthday gift and I was very unsure of the purchase for a while and so grateful to have gotten them for my birthday. I use them every day and I love love love them! Cuyana Tote Bag: I had been eyeing this tote bag for a LONG time and I got a gift card for Christmas that needed to be used. So there ya go. It’s great for travel which was my reason for getting it. Also as a mom I need large bags to put ALL THE THINGS in. Yeti Tumbler: Andrew gave me a Yeti Tumbler for Christmas so I don’t know if it counts, but I have been using it NONSTOP! I love how cold it keeps my water and I for sure get the appeal. Old Navy Sleepwear: Old Navy in general has really stepped up their game recently! The workout clothes are some of my favs and the sleepwear is amazing! My current Old Navy Sleepwear favorites are: this relaxed tee, and another version here, these super cute printed shorts, and beyond comfy jersey shorts. Sweatshirt: I got this sweatshirt in March and have been wearing it NONSTOP! Sadly, it’s sold out. Hoping more come back. Outdoor Voices Bras: Outdoor voices was kind enough to gift me with one of their sports bras and it quickly became my favorite! Check them out if you need a good one! I also wanted to note that I have a fun new Amazon shop page! You can shop all my fav things to buy on Amazon, which is basically everything we buy! Most of these items are included. So check it out here! What is one of your best purchases this year? I think I’d like the ice roller too! We have Yeti’s too and also love them. Great for transporting your drinks for sure. My husband purchased me two tumblers, and I love them both. He also had my initials monogrammed on them so they are super special, and I drink from them every day! Loved this roundup, I’m obsessed with the ice roller! I use it every morning, best purchase I’ve made in awhile! I am definitely going to get my hands on some of that Origins Smoothing Souflee! It sounds divine! LOVE LOVE LOVE my AirPods! And I need to get that Origins Smoothing Souflee, sounds like something I need. I currently jade roll, but need to look into and ice roller! I have a yoga mat too and love it! I really want to do yoga again – it’s definitely one of my favorite workouts. I love Origins skincare products! Love all of these, but a good yoga mat is such a gamechanger! Yeti’s are the best. I’m a huge coffee drinker and this has been my best purchase this year too. I’m glad to hear Old Navy has upped their game again. I’d love to check them out! Yetti tumbler!! I’ve heard those are amazing! Love your blog, btw! These are all great ideas and would make great gifts too. I have my eye on that Classic Leather Zipper Tote. It is gorgeous and looks like it is quality too. Yes, the Yeti tumbler is definitely a worthwhile purchase. I was blessed with mine as a gift.